Francesca has taken over the beautiful space from a retired butcher. I wasn’t expecting such a lively kaleidoscope of colours and fabrics. Francesca has set up her atelier in the back of her boutique. Francesca draws or hand-prints her own designs on cotton, hemp or linen. The tablecloth I bought has colourful leaves printed on antique linen. Francesca’s boutique is located on Montisi’s main piazza. 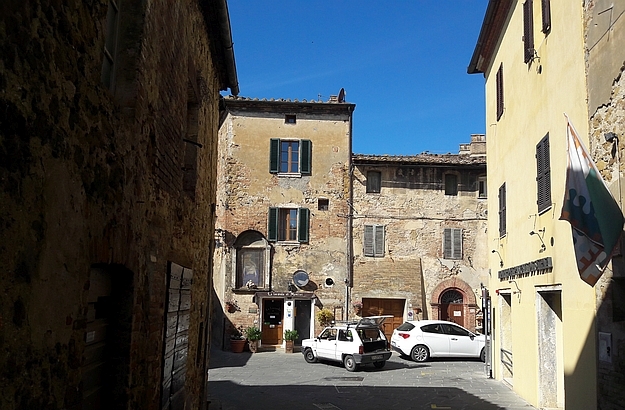 A few weeks ago, under clear blue skies, I was on my way from Montalcino to Perugia when the fancy of a good Italian coffee insidiously took me. I decided to make a stop in Montisi, a lovely village which I hadn’t visited in ages. I was strolling down Montisi’s main street, heading towards the bar I had made out from a distance, when I got sidetracked by a little shop on my right. Atop the entrance I could read the words Macelleria Casini – “macelleria” being the Italian word for “butcher’s shop”. Not a single chunk of fresh meat was displayed in the window, though; just a colourful kaleidoscope of printed textiles. Unable to resist the temptation – my passion for fabrics and interior design are universally known by now, – I walked in and was soon greeted by Francesca, the boutique’s owner, a very friendly lady. 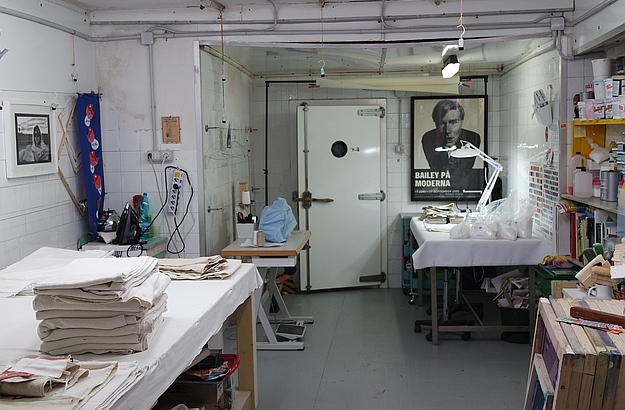 – I’ve seldom come across a butcher’s shop specializing in textiles! I said to her. – Well, she replied with a smile, there has to be a first time for everything, hasn’t it? Francesca explained to me that she had taken over the shop after the butcher’s retirement a few years earlier. The beautiful space had enticed her, and now she had her atelier in the back of it, and the actual store in the front, where she was displaying hand-printed textiles and pieces of art and design made by local artisans and artists. Originally trained as an architect, Francesca first worked as a graphic designer for years before she discovered her passion for traditional textile printing. 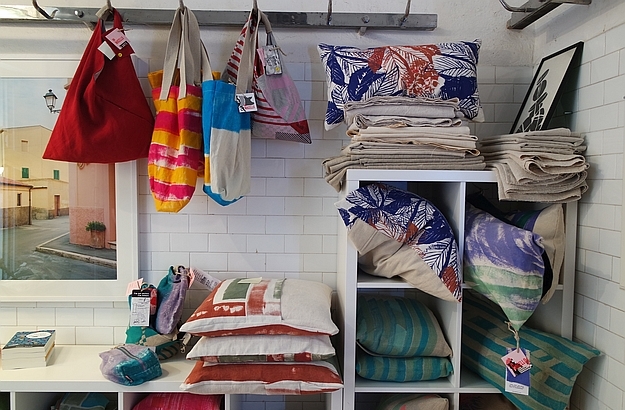 Today, she directly draws or hand-prints her own designs on natural cotton, hemp or linen. 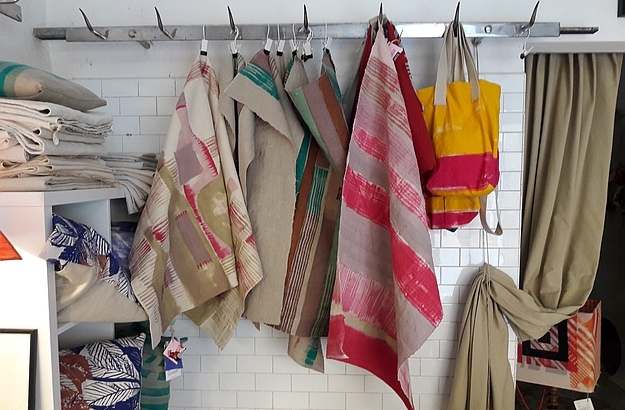 I must have spent half the morning in the boutique, trying to make up my mind, faced with the large and beautiful selection of bags, tablecloths and pillowcases that were hanging from the former butcher hooks. 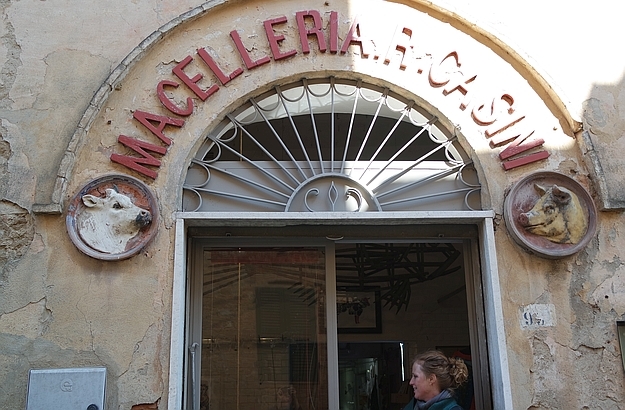 I also learnt from Francesca that she had decided to keep the name “Macelleria” as a play on words: in colloquial Italian, the word “macello” means “mess”. In the end, I had to hurry out of Montisi without my Italian espresso. 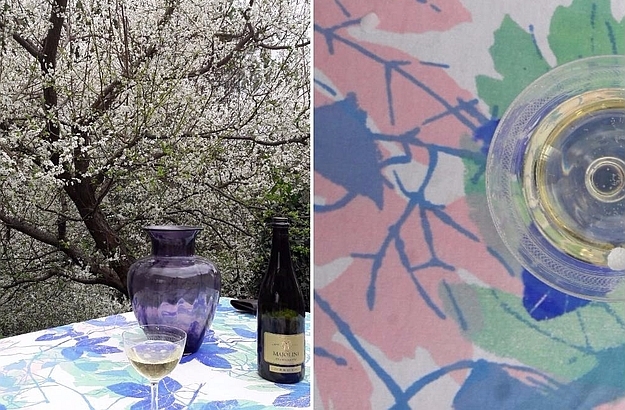 But the new tablecloth I had just purchased – colourful leaves printed on antique linen – had more than made up for it. Here is the link to Francesca’s online boutique: UnMacello. 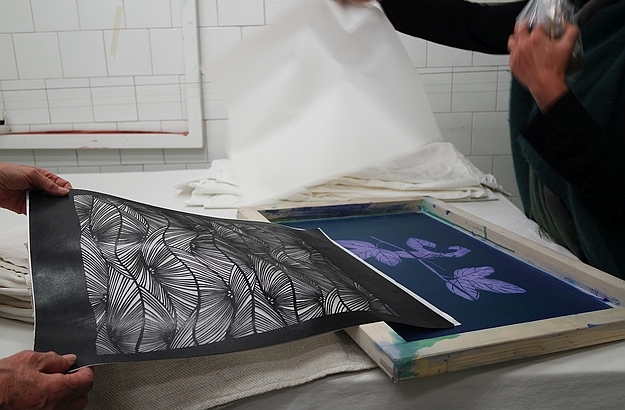 For made to measure orders or hands-on textile printing lessons during your holiday in Tuscany, do not hesitate to send Francesca an email.